The last few weeks it may have seemed that the only thing going on in the cycling world was gravel. Contrary to what you may have read in Cyclocross Magazine, there was also plenty of mountain and road biking action as well. In today’s Rumors and Rumblings, we look at some of the results from the last few weeks and couple cyclocross relevant stories as well. The U.S. Pro XCT XCO mountain bike series continued over the weekend in Big Sky Country in Missoula, MT. A familiar name in our R&R column so far this summer has been Sofia Gomez Villafane (Stan’s Pivot Pro Team p/b Maxxis). Gomez Villafane has taken full advantage of her first year as a professional mountain biker by turning in top tens at big races such as the Epic Rides Off-Road and the domestic UCI XCO races. Over the weekend she was at it again with a second-place finish at the Missoula UCI mountain bike race. Gomez Villafane took second place behind race winner Evelyn Dong. Alexis Skarda rounded out the podium, and Hannah Finchamp (Clif Pro Team) also scored a wide-angle podium with her fifth-place finish. On the Men’s side, defending U.S. National Champion Howard Grotts (Specialized) took the win. Richard Cypress Gorry (Rouleur Devo p/b DNA Cycling) finished second and Cole Paton (Giant Factory Off-Road Team) third. U23 cyclocrosser Caleb Swartz (Linear Sport / Trek), racing in his first year as an Elite mountain biker, finished an impressive fifth at the race. Scott Funston (Kona Junior Factory) took home a third in the Junior Men’s race, and his teammate Calder Wood (Kona Junior Factory) finished seventh. Full Women’s and Men’s Elite results available from the UCI. Just one week after the big, hot Dirty Kanza 200 was held on the Great Plains, road cyclists descended on Oklahoma for the big, hot three-day Tulsa Tough series of criteriums. The Tulsa Tough event features the Blue Dome Criterium on Friday, Tulsa Arts District Criterium on Saturday and the River Parks Criterium on Sunday. The latter is famous for Cry Baby Hill thanks to its impact on the race and the party-like atmosphere that pops up every year. This year, the Tulsa Tough road stars included a number of familiar cyclocross names. 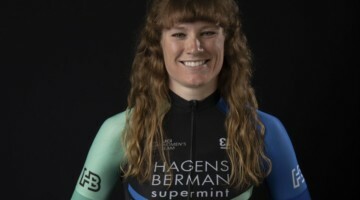 At Sunday’s River Parks Crit, Australian ’Cross National Champion Peta Mullens (Hagens Berman / Supermint) finished third in the sprint, and in the Men’s race, Eric Brunner (303 Project) remained en fuego with a second-place finish. Danny Summerhill (Texas Roadhouse) continued his strong riding by finishing third. Brunner’s second in Tulsa adds to his Collegiate Road Race National Championship he captured at the end of the school year. One of the top stories of the weekend was the racing of young star Katie Clouse (DNA Cycling Team). Clouse won the Junior 17-18 Cyclocross National Championship in Reno (and finished third in the U23 race). Against a field of the best women racers in the country, Clouse finished 12th on Friday, 9th on Saturday and 10th on Sunday. Saturday’s Tulsa Arts District Criterium was a good one for the Schneider Sisters, with Skylar (Boels-Dolmans) finishing second and Samantha (ISCorp p/b Progress Software) third. Lily Williams (Hagens Berman / Supermint) took home seventh, Christina Gokey-Smith (Colavita / Bialetti Cycling) eighth and Clouse ninth. Samantha Schneider kicked off the weekend with a win on Friday. Mullens finished third and Williams sixth. Brunner kicked off his weekend with an eighth-place finish on Friday. Brunner took fourth in the Men’s Omnium, and Mullens took fourth, Williams fifth and Clouse seventh in the Women’s omnium. Full event results are available from usacycling.org. Up this weekend on the road is Masters Road Nationals in, poetically, Augusta, GA. Adam Myerson and others are looking to defend their titles and bring home a green jacket along with their Stars-and-Stripes jerseys. With cyclocross season three months away, there’s no time like now to start getting a little bit excited about the coming season. Today, the Charm City and DCCX races provided a reason to get hyped for October U.S. cyclocross when they announced the formation of the four-race Parkway CX Trophy Series. The four-race series will be held over the two weekends of UCI racing at the annual Charm City race in Baltimore and DCCX race in the nation’s capital. Stay tuned for more details about this new partnership between the two U.S. cyclocross staples. Stop us if you have heard this one before, but Mathieu van der Poel won another bike race. 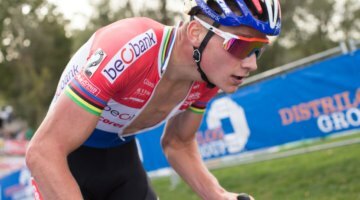 We’ve seen him win a three-day stage mountain bike race and finish in the top five at UCI XCO mountain bike World Cups, but this time, Van der Poel showed his versatility with a win on the road. Over the weekend, Van der Poel won the 106km Ronde van Limburg road race to add another title (and some new headwear?) to his palmares. As a prelude to his Ronde van Limburg win, Van der Poel also won the GC at the three-day Boucles de la Mayenne stage race in France the weekend before. Eli Iserbyt won the jersey for the top U23 rider. Wout van Aert had a memorable first full go at the Spring Classics this year, capped by a third-place finish at the Strade Bianche in March. Van Aert has been laying low since Paris-Roubaix, in part due to the passing of his teammate Michael Goolaerts during that race. Last week, Van Aert did some television commentary during a race in Belgium where he laid out his plans for the coming months. On the road, he will be targeting the August 12th European Championships in Glasgow. The good news for cyclocross fans is he said he is planning a full cyclocross campaign as he seeks to win his fourth-straight world championship in Denmark in 2019. Two-time defending World Champion Sanne Cant has been the flagship rider for the IKO-Beobank team that is primarily a youth development program. Cant will continue to lead the team for the next several years after she renewed her contract for another three years. For more offseason updates, see our Rumors and Rumblings archive.